The Restoration Team has been concentrating on disassembling B&O 20's wood beam passenger trucks and completing Caboose 1. Because of those two projects, and the occasional rainstorm, CP 29 has been kept covered this spring. It was partially untarped for the Annual Dinner on June 9. In a couple of weeks B&O 20's usable metal truck components will be sent out for sandblasting. The wooden frame pieces will be duplicated with new oak. Assembly of the truck frames should be done later this summer. As time and crew size permit, the car will be completely uncovered and the rolled roofing removed to expose the car's terne metal roof. Hopefully there is little damage to the metal roof other than nail holes. 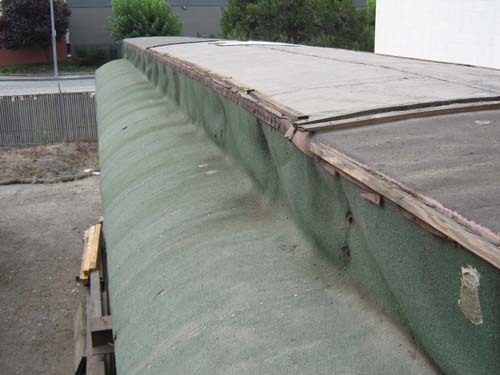 CP 29's roof is still covered by rolled material installed by Dutch Muckelow. 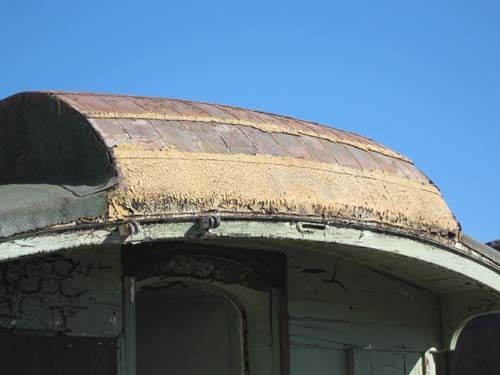 The Restoration Team intends to remove the material this season to examine the clearstory roof. Both photos by the author. Thanks to the 65-mph trip from Redwood Valley to Petaluma, much of the rolled roofing was blown off the car ends. The metal plates are Terne metal, like the old-style tin cans. They are soldered together. By the time you read this the new oak timbers for CP 29's trucks will have been ordered and delivered, and final cutting and assembly will have been started. The creation of a wood pattern for the 1874 Master Car Builder standard pedestal may also be underway. In addition, Restoration Team members have been cleaning and rethreading bolts and square nuts, and repairing or replacing tie rods and metal straps. Actual use of the trucks beneath CP 29 requires lubrication of the axle journals. For generations railroaders used wool 'waste', scraps of wool wrapped tightly into 1 inch-diameter ropes that were soaked in special lubricating oil and packed tightly side-by-side into the lower half of the journal box beneath the axle. 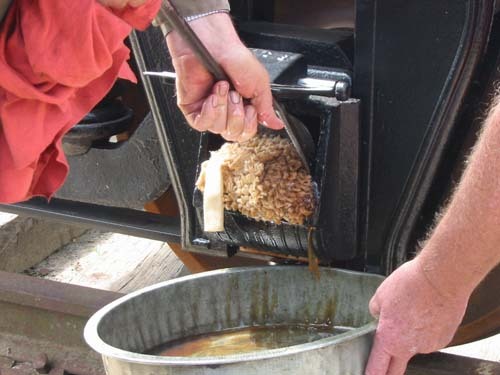 The oil-soaked wool waste rubs against the underside of the axle, transferring the oil to the metal surface that rubs against the brass bearing as the axle rotates. After World War II the railroad industry switched from wool waste rope to lubrication pads. Each pad consists of a rectangular core of foam rubber covered by two thick pads of shaggy cotton cloth. When properly installed in the journal box the foam rubber presses the lower pad into the lubrication oil and against the floor of the journal box, and presses the upper, oil-soaked pad against the underside of the axle. Installation of a new pad in an assembled truck's journal box is complicated. 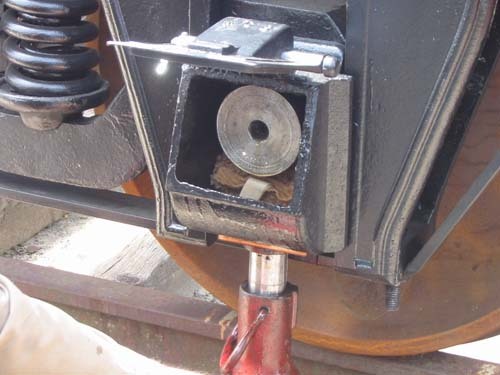 First the journal box must be jacked up to allow removal of the bearing brass and wedge, then lowered to rest on the axle. At that point there is sufficient clearance to remove the wool waste or lubrication pad, and clean out the box. The journal surface is wiped clean. 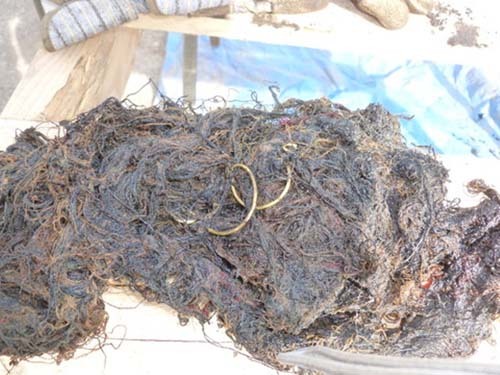 New oil-soaked material, either wool waste or a pad, is positioned in the box beneath the journal surface. The box is jacked up to allow installation of the bearing brass and wedge then lowered back into its final position. If waste is used, more is added as needed. Finally the box is filled with the proper oil. This procedure is repeated for each journal box. To avoid injury in case the box slips off the jack, all work is done with a journal hook and a push bar. The worker's fingers are never placed inside the box. When the Restoration Team assembled the trucks for P&SR #1 we did not have pads or wool waste available. Instead, the journal surfaces were greased. We could get by without the usual lubrication because the trucks would not be moved more than a few feet at a time. A set of pads was installed before the caboose body was set onto the trucks. As described above, the procedure to install the pads in an assembled truck is complicated and hazardous to the worker, so we will insert a pad in each journal box during assembly. Caboose #1's pads were generously donated by the Western Railway Museum at Rio Vista Junction along with 5 gallons of the special fast-wicking oil used for journal lubrication. The Museum no longer has a surplus of the pads we need. We had to find our own supply. At this time there is only one manufacturer of lubrication pads in the US: Hooper Industries in Baltimore, MD. Due to the mechanical breakdown of their specialized machine, all pads must now be sewn by hand. The price per pad is $75. For our project the cost will be $600 plus shipping. Photo 1: Wool waste removed from B&O 20's journal boxes will be replaced with lubrication pads. This photo by Steve Atnip; all other photos by the author. 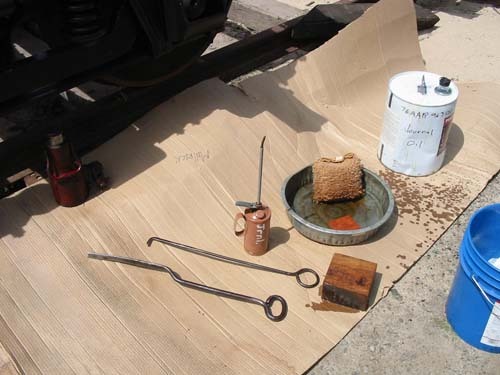 Photo 2: From left to right are a push bar, waste hook, oil can, jack support block, pre-soaked lubrication pad and extra oil. Photo 3: After the axle and box interior are wiped clean the soaked pad is pushed beneath the axle. Keep all fingers outside the box! Photo 4: With the new pad in position the box can be raised up to allow insertion of the bearing brass and wedge above the axle. 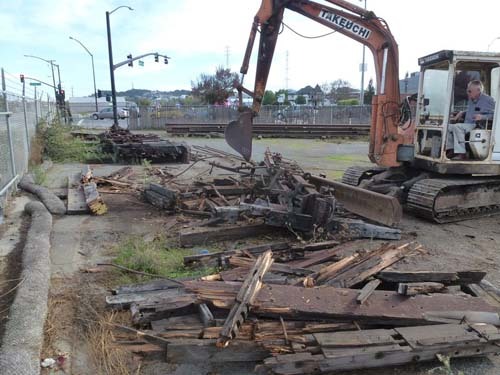 Replacement timbers for CP 29's trucks were ordered from Channel Lumber in Richmond and the bill paid in August. 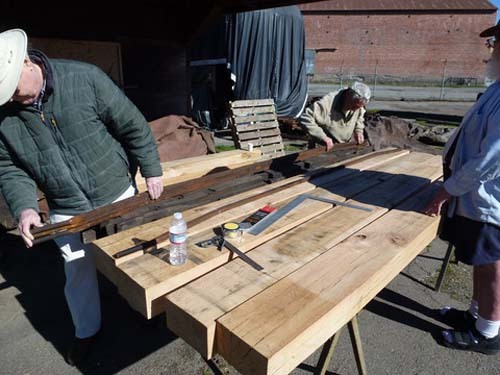 Jeff Millerick picked up the rough-shaped oak timbers in mid-September and placed on pallets in the De Carli Trolley Museum yard. We are searching for someone with a large-capacity band saw to make the final cuts on the timbers. As you read in our President's Message, we have to reduce our expenditures for CP 29 until donations and other income can cover the costs. The Board of Directors voted to place CP 29 third in line for restoration funding and project work. Restoration Team members will assemble the truck frames during the winter and spring months, then cover the frames with tarps. Completion of the trucks will proceed when the pedestals are cast. Our last estimate of the cost for the eight pedestals, cast in the U.S. was $4,200. 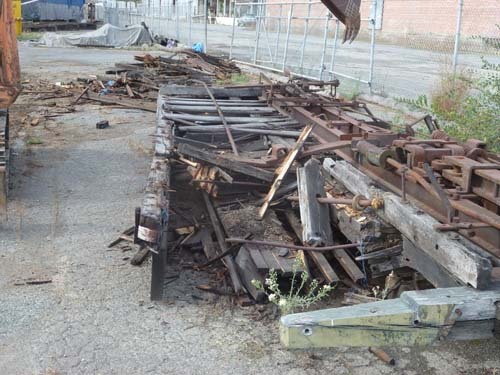 In our successful 2011 National Railway Historical Society Preservation Grant application, we proposed to use the Grant Award funds within one year to purchase the oak timbers, paint and steel needed to assemble new trucks and sandblast the usable metal parts. Any surplus funds from the Grant Award would be used for the pedestals and to purchase air brake components, platform timbers and couplers. We received $3,300 from the NRHS and have to match it at a ratio of 1 to 1. Unfortunately the cost of the oak was driven up by the laws of supply and demand. Little, if any, oak suitable for our project is harvested in California. 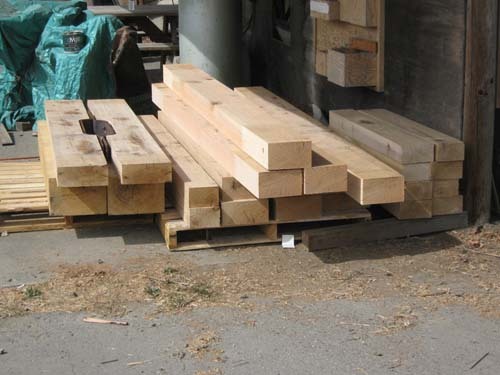 Our only source of supply is recycled bridge and building timbers, and we found just one vendor in California who could supply what we need. The numerous large, shaped pieces needed for the trucks cost a total of $6,459.75. That price is much higher than the cost of the oak used for Caboose 1, but CP 29's trucks are 18 inches longer that those of Caboose 1, requiring larger timbers. However, the high cost "eats up" most of the Grant Award (97 percent). By allocating to the Grant Award one half of the cost of flat steel bars ($128.67 of the $257.25) needed for the trucks, we covered the rest of the required expenditure. To assemble the truck frames (minus the pedestals) requires the metal components be sandblasted and painted. Unfortunately none of the Restoration Team members works at a sandblasting facility. Due to environmental factors (including dust from lead-based paint) and the large size of many components, the Society will not do its own sandblasting of parts. 1. Mill newly purchased beams: $0 (labor donated). 2. 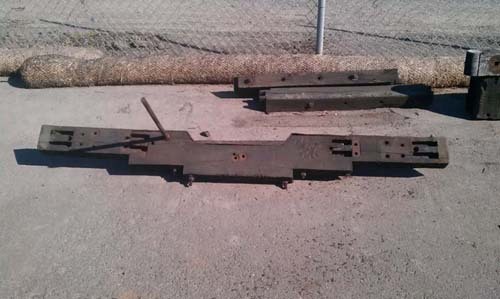 Sandblast and paint castings, tie rods and flat bars: $2,100. 3. Assemble truck frames: $0 (labor donated). Photo 1: This stack of oak will be turned into a pair of trucks for CP 29. Half of the wood's cost was paid by the 2011 Restoration Grant Award from the National Railway Historical Society. All photos by the author. Photo 2: Four new end beams are needed; two with the center notch on top and two without. The center notch is for clearance of the brake rods. The outer mortises receive the side beams and the inner mortises receive the safety beams. Photo 3: The tenons at each end of this safety beam must be replicated on each of the four new beams for each truck; eight safety beams in total. A steel half-circle is bolted to the underside of each safety beam to support the axle if it breaks. The tenons fit into mortises cut into the end and center beams of each truck. Photo 4: These are only a few of the metal parts that must be sandblasted and painted prior to assembly of the truck frames. 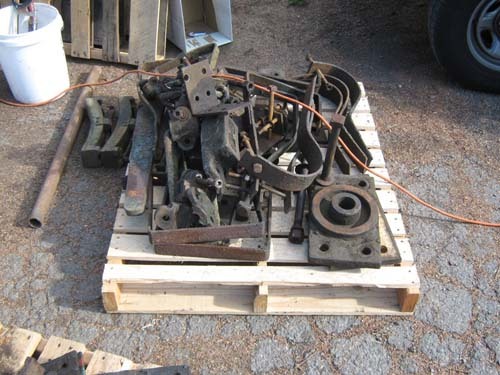 In November the floor assembly of B&O 20 was completely torn apart, with the metal components saved for reuse under CP 29. 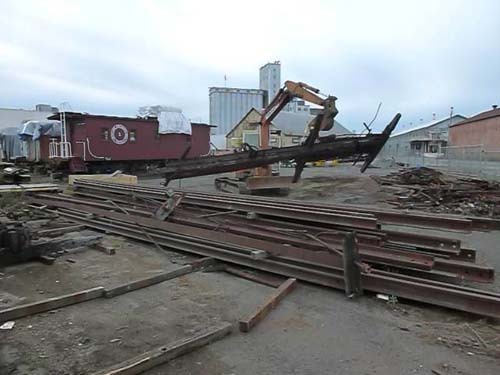 Dismantling of the car was necessary to make room in the De Carli Trolley Museum yard for the Christmas tree vendor. Space is at a premium due to our recent acquisition of P&SR boxcar 2 in October. All of the draft gear and brake system components are stored around the yard, awaiting their turn to become part of CP 29. Some pieces of the wood floor were kept to guide our Restoration Team during installation of the metal parts. The rest was hauled off to the dump. It is a very sad end for what was a beautiful Wason passenger car until the roundhouse roof fell in. Photo 1: Lauren Williams used his excavator to demolish B&O 20's wooden floor. Photo 2: The excavator starts working on the second section of flooring. 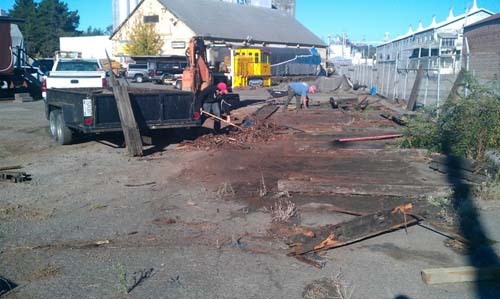 Much of the wood was shattered by the impact of the collapsed roundhouse roof. To add insult to injury, eight years of Baltimore rain and snow resulted in rot throughout the wooden floor. Photo 3: One of the Bohoup 3-stem couplers and its support frame is completely removed from the car floor. Photo 4: The coupler and draft gear will be placed on the timbers next to the stack of rails. Photo 5: Dimitri Kosdroski and Steve Atnip clean up the debris. This photo by the author; all others by Steve Atnip. Our 2013 season began in late January with continuation of the restoration work on CP 29's trucks. The car is still covered with its tarp to keep the rains out. Jeff Millerick, Michael Davis and Dimitri Kosdroski disassembled the leaf springs from B&O 20 in preparation for sand blasting. Frank Moraes, Gus Campagna and Lauren Williams began the layout work for cutting and routing of the truck side frames. Frank has already shaped some of the shorter pieces. In his metal shop Jeff straightened the three unbroken equalizer bars. These had been curved by the B&O shop crew to make use of coil spring sets that are too short for the trucks. When our trucks are reassembled they will be fitted with spring sets of the correct length. Each wrought iron bar was positioned on a heavy steel table so one end was flat against the table top. This end of the bar was then locked to the table using two big C-clamps. 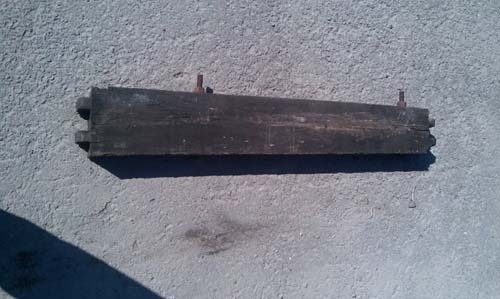 A six-foot-long piece of tubular steel was clamped to the opposite end to form a handle. Then the equalizer bar was heated using a very large torch and lots of acetylene and oxygen until the bar was red hot where it was bent. Jeff then pushed down on the extension handle until the bottom surface of the bar was flat against the table. A third C-clamp was fastened to the bar and table. At that time Jeff gave the bar several big whacks with a sledge hammer to reset the crystalline structure of the bar, leaving it permanently straight. This is basic Blacksmithing: heat the bar until it is cherry red in color, then "strike while the iron is hot". When they cool the bars are ready for sand blasting. Photo 1: B&O 20's truck equalizer bars were modified by shop workers to function with short coil springs. The bars have been straightened, and springs of the correct height will be acquired for CP 29. Photo by the author. Photo 2: Lauren Williams, Frank Moraes and Gus Campagna are measuring critical dimensions of a side beam. The four new beams will be cut to these dimensions. Photo by Steve Atnip. Our recent move into the new Hogarty Library space turned up a real gem: a genuine Wason king pin cover plate from an NWP coach. 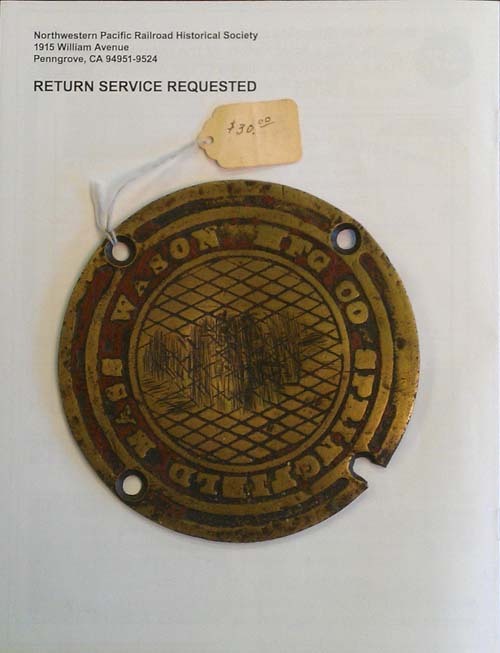 A tag on the reverse side states the plate came from a NWP interurban car. 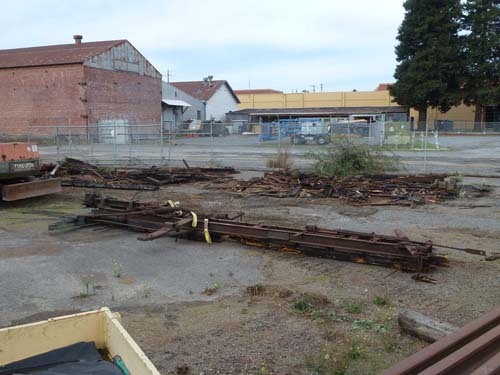 Based on our roster data, the plate was fastened to the floor of one of six coaches built for the San Francisco & North Pacific Railroad in 1884 and 1885. Numbered 17 through 22, the cars retained their numbers when the NWP was formed in 1907. 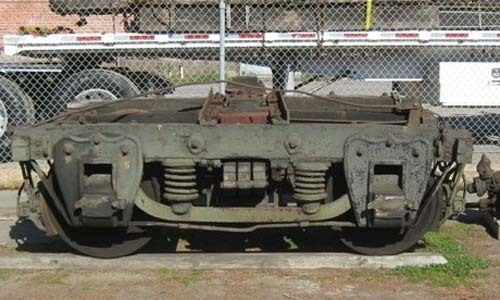 In 1911 they were converted into electric trailers for use with the Marin County commuter trains. The trailers were numbered 234 through 239, but not in original sequence. NWP 239 burned at Tiburon in 1921. The other cars were retired December 31, 1930. The 6" plate is cast in brass and painted with red enamel. Years of scuffing by boots and shoes wore down the upper surfaces. The center of the plate was pushed down into the king pin hole by the weight of passengers who stepped directly onto it. Sand particles tracked into the car accumulated in the depressed area and were scuffed back and forth, leaving deep scratches. Russ Clover is working up drawings of the cover plate. We intend to reproduce it as a resin casting. Two copies will be installed in CP 29. Other copies of the cover plate will be offered for sale. When I examined B&O 20 and 21, and CP 29, none of the cars were equipped with this style of cover. All three had unlettered rectangular plates, which may indicate each car received new floor boards during an overhaul and the original plates were discarded. 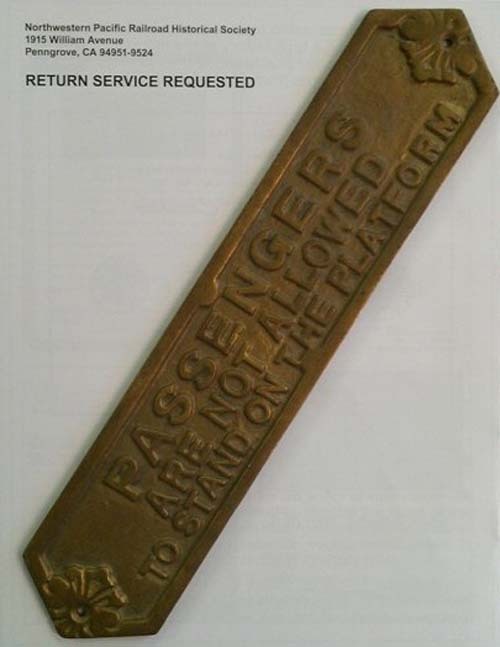 Also discovered in the Archives was a brass door plaque: "PASSENGERS ARE NOT ALLOWED TO STAND ON THE PLATFORM". This plaque, too, will be reproduced for use on CP 29 and perhaps NWP 605. Work continues on the trucks for CP 29. Frank Moraes, with assistance from Jeff Millerick, continues with cutting and notching the oak beams. Jeff, Steve Atnip, Michael Davis and Dimitri Kosdroski sorted the metal parts and loaded many into Jeff's truck. These parts have gone to the sand blaster's shop. When they return, the parts will be painted flat black. The completed timbers will also be painted black. The wheel sets, however, will be left au naturel so any metal cracks will be visible. Photo 1: This king pin cover plate was cast by the Wason Manufacturing Company for one of six coaches built for the San Francisco & North Pacific. The souvenir cost its donor $30 but it is priceless to the Society. Photo 2: The plate may have come from electric trailer NWP 234, which was converted from NWP 22. This car was built as SF&NP 22. Photo 3: This door plate also was found in the Archives. We have no record of the donor for either plate. If you know, please send the information to the author or Society Archivist Gus Campagna.